Collar/choker style necklace. 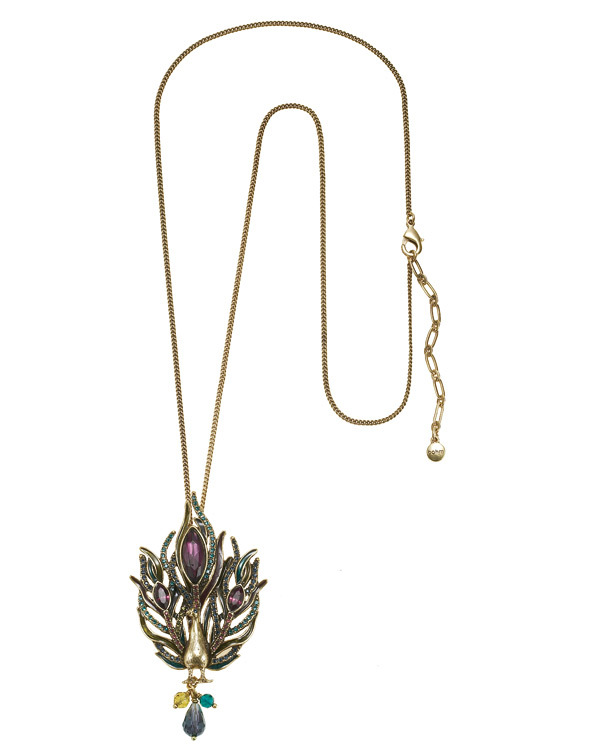 Beautiful sinuous pendant encrusted with Swarovski crystals and carefully applied watercolour enamels. The pendant is 4 inches/10cm in length. It measures 15 inches/38 cm to an adjustable 18 inches/46cm. Shades of peacock blue, green and purple. Burnished gold plate. 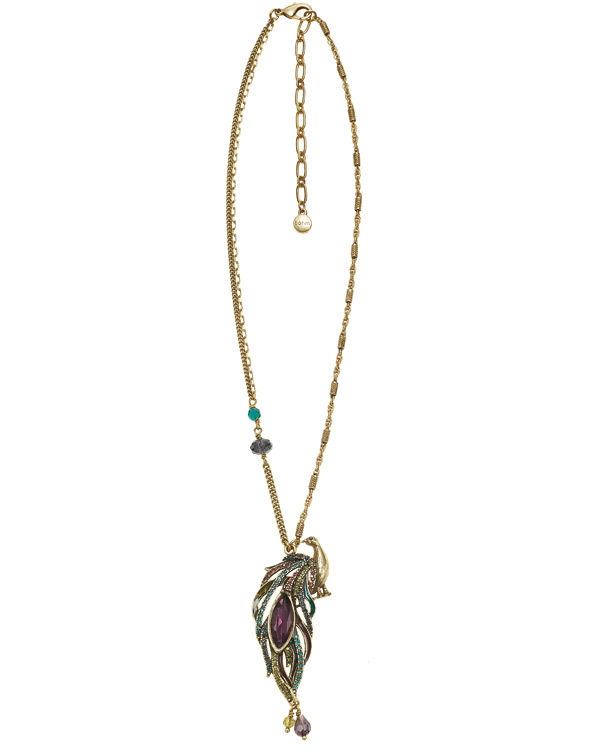 Long length necklace with beautifully detailed peacock bird, encrusted with Swarovski crystals and carefully applied watercolour enamels. The pendant is 3.5 inches/9cm in length. The chain, a simple curb (2mm aprox.) measures 32 inches/81 cm to an adjustable 35 inches/89cm. Shades of peacock blue, green and purple. Burnished gold plate. 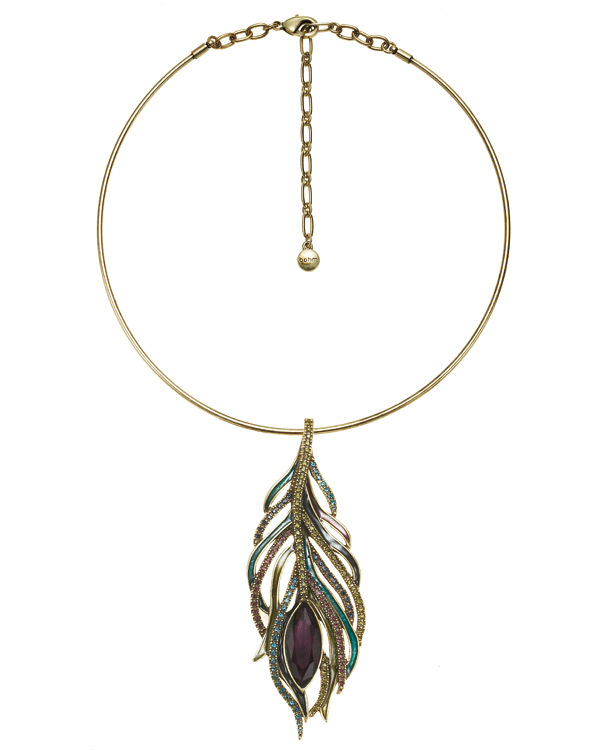 Beautifully detailed peacock bird pendant necklace, encrusted with Swarovski crystals and carefully applied watercolour enamels. The pendant is 3 inches/7.5 cm in length. The chain, uses a variety of chain styles, measures 18 inches/46 cm to an adjustable 21 inches/53 cm. Shades of peacock blue, green and purple. Burnished gold plate. Beautiful sinuous peacock feather earrings. 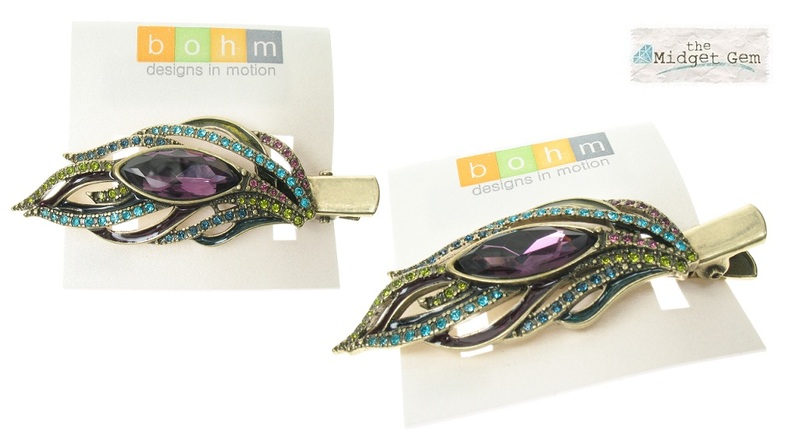 Encrusted with Swarovski crystals and carefully applied watercolour enamels. The actual feather measures 3cm/30mm in length. total length of the earring is 3.5cm/35mm. Shades of peacock blue, green and purple. Burnished gold plate. Swarovski crystal studded globe earrings for pierced ears. Globes measure aprrox. 1cm/10mm. Shades of peacock blue, green and purple. Burnished gold plate. 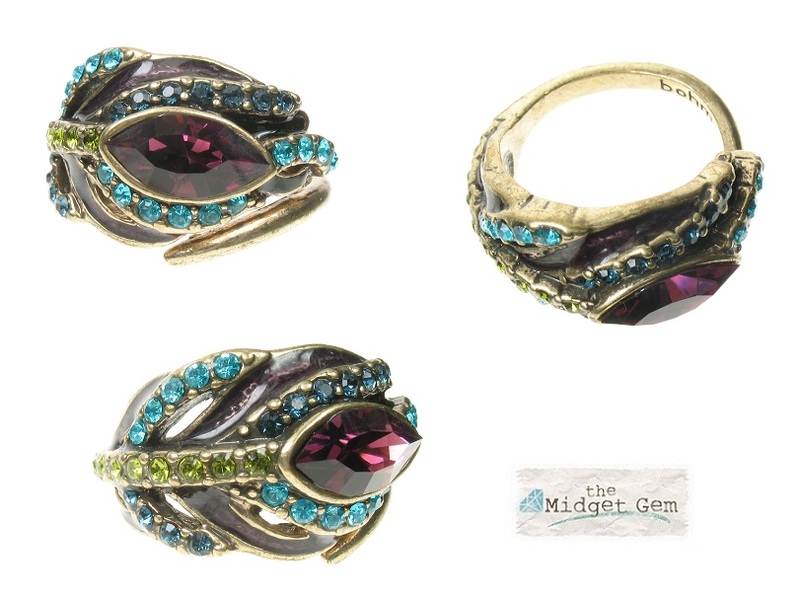 Beautiful sinuous feather wrap-around ring encrusted with Swarovski crystals and carefully applied watercolour enamels. The feather is 1.4cm/14mm at its widest and 3.5cm/35mm in length. The ring is adjustable. Shades of peacock blue, green and purple. Burnished gold plate. 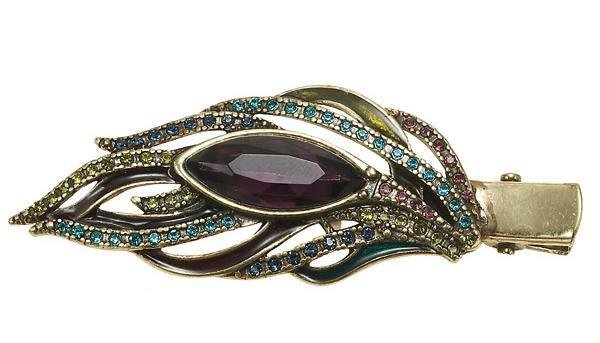 Sinuous feather hair clip. Feather measures 5cm/50mm. Total length 6.5cm/65mm. Sprung clip (measures 4cm/40mm) for a section of hair. 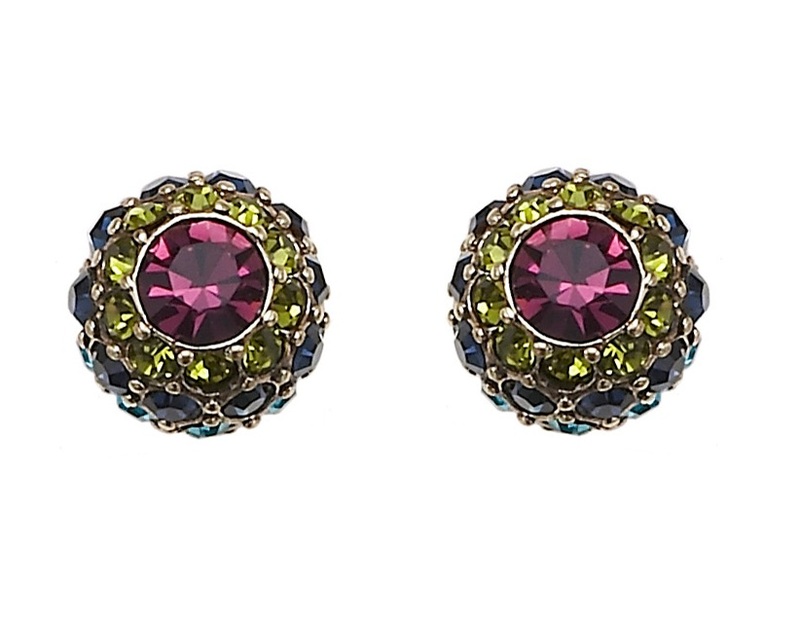 Encrusted with Swarovski crystals and carefully applied watercolour enamels. Shades of peacock blue, green and purple. Burnished gold plate.